In the presence of constant and painful reminders of the deep roots of racism in our country, we, the U.S. Federation of the Sisters of St. Joseph join with the Leadership Conference of Women Religious (LCWR) in committing to the critical work of creating communion, examining the root causes of injustice and our own complicity, and purging ourselves, our communities and our country of the sin of racism and its destructive effects. ¶ Following in the footsteps of Jesus, we commit ourselves to examine the root causes of injustice, particularly racism, and our own complicity as congregations, and to work to effect systemic change as we struggle to ensure immigrant rights, promote non-violence and protect Earth and its biosphere. ¶ We pledge prayer, education, and advocacy and commit to using our collective voice, resources, and power in collaboration with others to establish justice, which reflects God’s abundant love and desire that all may have life. Who are the Sisters of Earth? Sisters of Earth was founded in 1994 by several Catholic Sisters from the U.S. and Canada, who were engaged in exploring the new cosmology and implications for this emerging worldview. 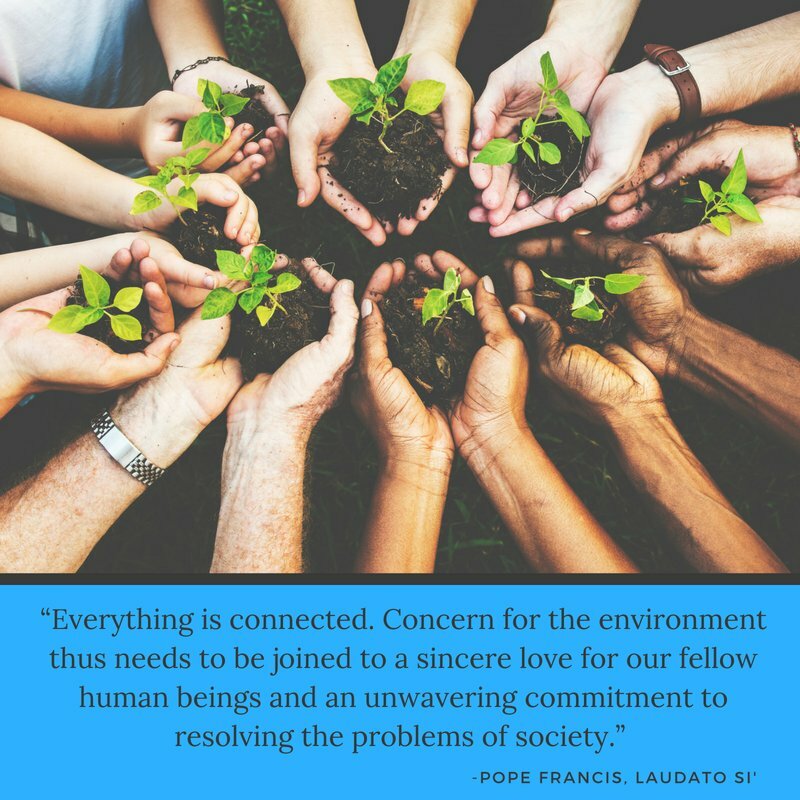 Sisters of Earth is an informal network of women who share a deep concern for the ecological and spiritual crises of our times and who wish to support one another in work toward healing the human spirit and restoring Earth’s life support systems. We are teachers, gardeners, artists, writers, administrators, workshop and retreat presenters, mothers, contemplatives, and activists in North America, South America, Europe, Australia, New Zealand, and beyond. This network of sharing and support is open to all women whose life and work would identify them as Sisters of Earth. We hold a general meeting every two years in different parts of the USA. This July, Sisters of Earth met in Cincinnati at Mount St. Joseph University. Representing Carondelet were associates and Sisters from most of our provinces. The theme for the 2018 conference was “Sharing the Wisdom, Shaping the Dream: Creating the Future We Want.” Throughout the conference, we together explored this theme through prayer, ritual, conferences, workshops, conversations, and pop-ups. Pop-ups were five- to ten-minute presentations that gave attendees a chance to share examples from their work/ministry/lifestyle of Active Hope. Those of us from Carondelet would like to share with you our own pop-ups in the context of our takeaways from the conference experience. Some of our takeaways are connected to specific conferences and moments within the Sisters of Earth 2018 Conference. Other reflections/concerns are takeaways that are located in the context of our preparation for Chapter in 2019. I would be glad to have conversation about any of these topics. Life on Earth has been successful in adapting to change for about four billion years, why not use some of her strategies? One way to do this would be to use, in Gloria Garcia, IHM’s terms, bio-mimicry or bio-emulation, using life’s strategies. Principles involved in doing this include interdependence and valuing diversity for health of the whole. In our concerns about “oneness”, do we also value diversity? Are we leaving room for emergence in our planning and in the processes we use and put into place? A very powerful experience of the SOE conference was the “hybrid” presentation of Awakening the Dreamer. The process of beginning in gratitude (Who are we? ), moving to our pain (Where are we? ), seeing with new eyes (How did we get here?) and going forth (Where do we go from here?) deepened my awareness and called me to active hope. I felt these questions echoing within me as a way to reflect and to live more authentically in my personal life, and also in my ministry and community circles. There is an urgency to question the long-held assumptions of church, country, and community. There is an urgency to live the challenges of “inter-being” and to truly be in communion with the Earth family. The SOE conference was a gift and a privilege! It was arduous work. I was just too tired. It was out of the question. To do one more grant proposal in addition to all I had already done as a board member in attempting to assist Annunciation House in El Paso, Texas, would be more than I could undertake. Two messages came: one from our congregation’s Sister Danielle Bonetti and one from my longtime friend, a Daughter of Charity team member. The Conrad Hilton Fund for Sisters was offering an emergency grant to help alleviate the suffering, especially of parents and children. So it was that I began the process, knowing that Director Ruben Garcia and many Annunciation House volunteers were working extremely hard, struggling with the chaotic fallout from President Trump’s Operation Hold the Line. As the deadline approached for submitting the proposal, I felt that my entire effort might be for naught as a serious setback seemed to place my efforts in jeopardy. I met only with the greatest kindness, however, from Fund staff members who were extremely caring as they acknowledged that the setback was on their end. Then late in the day on Wednesday, July 25, came the email announcement of a six-month grant of $50,000 from the Conrad Hilton Fund for Sisters to be used for Annunciation House during the next six months. The purpose of the gift was clearly stated: All aid necessary for the reunification of parents and children, especially physical, legal, and transportation aid. After filling out the acceptance form online and receiving the affirmation that it had been successfully submitted, I received notice that the check would be awarded within a week. Many families will find hope because our congregation could be the recipient of such a gift thanks to many who have helped to make it a reality.